Here's the real difference between us and the other chocolate suppliers of bulk white chocolate. Tahitian vanilla beans mixed with fresh milk strike a balance of sweetness with pure cocoa butter. Once you experience the best white chocolate you'll know why this is the one for you. Shop online and buy in bulk at wholesale prices with confidence knowing you are getting the real deal in professional chocolate. Take your recipes to the next level with our Belgian white chocolate we have crafted using traditional chocolate making techniques and experience the superior quality that will impress all chocolate aficionados. Santa Barbara Chocolate wholesale bulk Kosher certified white chocolate is based on pure prime pressed cocoa butter, the best in the industry. We think you'll find our chocolates to be fresh and light with a smooth even melt. Easy to use viscosity, consistent quality and great value are three of the reasons why pastry chefs and professional chocolatiers choose Santa Barbara Chocolate for wholesale supply. We hope to become your partner in building your business and chocolate success. White chocolate, when it is of high quality, is one of the most enjoyable chocolate types. Use it as a base for flavoring to showcase a color or taste profile. In our fruit chocolate truffles for example, we will reduce a mix of fresh berries to create a berry compote. We mix this fresh berry compote with our Belgian white chocolate all melted and mixed well (you just made a white chocolate ganache). We stabilize this berry ganache with honey and then allow it to set (use about 10% by ganache weight). You'll have a brightly colored berry ganache with big flavor. We pipe this ganache once it sets into dark chocolate shells (I like to use a bitter dark 72% to mould the chocolate shells). The result is a perfect balance of berry flavor with dark chocolate. When you bite into the truffle you'll see the beautiful fresh berry color with intense berry smell. Think of white chocolate as the base which can carry your exquisite flavor choice. This is the level of professional candy making and chocolate dessert creation we hope to help you achieve. GMO FREE soy lecithin and natural vanilla. Bring 8oz of fresh blueberries to a boil and reduce so that some of the moisture cooks out. Mix into your reduced blueberry puree 4oz heavy cream, 2oz honey and bring to a boil. Pour blueberry cream honey mixture over 16 oz Santa Barbara Belgian White Chocolate and mix well so that all the white chocolate is melted and smooth (an emulsion blender works wonders with this step). 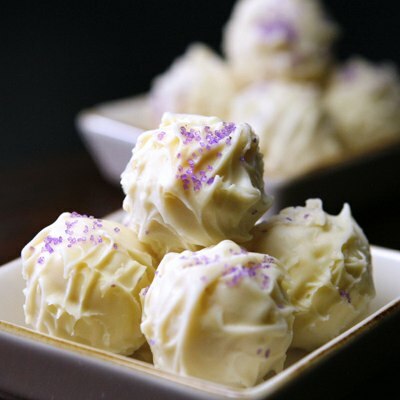 Chill blueberry Belgian White Chocolate truffle centers overnight (this is called a blueberry white chocolate ganache). Spoon and hand roll your Blueberry White Chocolate Ganache and fork dip in 20oz of tempered Santa Barbara Belgian White Chocolate. Decorate your truffles with fine grain white sugar that has been colored with natural blue food coloring. Sugar, cocoa butter, whole milk powder, soy lecithin (emulsifier), natural vanilla extract. Best used within 12 months of production date. This is the Belgian White Chocolate if you want real gourmet quality. Made to our specifications using the best artisan creamery ingredients, our White chocolate couverture is easy to melt and use in chocolate making or pastry. Customers tell us all the time they can't stop eating the chocolate right from the package.